Learning how to drive a golf ball for beginners is arguably one of the most exciting elements of the game. However, it is quite difficult especially for people who do not have experience on the golf course. The majority of people want to step onto the tee for the first time and hit the ball long and straight into the fairway. It is not impossible especially if you follow the valuable advice below on our top golf ball driving techniques. Rules laid down by the golf associations state that in competition a maximum of fourteen golf clubs can be carried. This is usually made up of Driver, 3 wood, 5 wood, putter, irons numbered 9 down to 3 plus a pitching wedge and sand iron. Modern golf clubs have continued to improve and new rescue woods and open faced lofted irons are now available as a matter of choice. Note that equipment today is not necessarily tailored for 7-8 degrees drivers like it was the case in the past. To drive the ball longer, understand that it needs to be up in the air on an excellent trajectory. 9 & 10 degrees divers are what many expert golfers use and can quickly drive the ball over 300 yards. Nowadays, however, average driver lofts for beginners are 11.5 degrees. They are ideal because a higher lofted driver will give the player more of a carry and it can also help you to stay more consistent with the shots. The flatter the face of the golf club the more difficult it is to control direction. 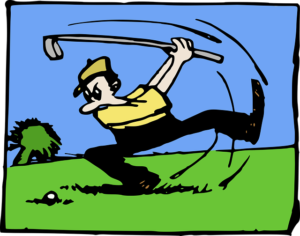 A pun on the golf circuit is ’Only God can hit a straight one iron’. 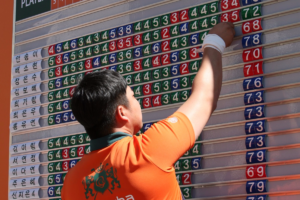 Stableford scoring explained here. Remember that the driver’s loft affects the carry and roll. When it’s highly lofted, it can move the ball for long distances which enable you to take advantage of the most distance that your drive can deliver. Worth noting is that it can give better performance in wet conditions. Invest in a lower loft if you want drives that give you a lot of roll on the fairway. These are ideal if you will be playing on courses that feature straight and long fairways so that you can enjoy more distance off the bounce. While learning how to drive a golf ball, it helps to focus on understanding the perfect position to hit. To achieve the proper golf stance position, your eyes, shoulders, hips, knees, and forearms need to be parallel to the target line. The simplest ways to visualize this to think of a railroad track where the ball is on the outside rail and the body is inside the rail. The feet should be at shoulder width. If you are looking for a shorter stance, narrow the distance by about two inches. It is an excellent position as it enables the player to rotate towards the target to downswing. Note that flexibility and the speed of body rotation will determine the right foot placement. The swing should be natural and not forced. Let the club do the work! Balance body weight on the balls of the feet and not on the toes or heels. When you are ready to take the swing, slightly flex your knees so that they are directly over the balls of the feet which should give incredible balance. Remember that you should bend the body from the hips and not the waist. The hands should hang forward of your pants zipper. Note that shoulders and arms should form a triangle while the elbows are supposed to point to the hips. Upper body should always be tension free, but you may feel a little bit of pressure on the inside of the back leg. The proper position will increase your chances of success significantly. Drive for show, putt for dough! or so the saying goes? Some mistakes are pretty common on the golf course for both beginners and professionals. An example of such is the hook and slice that can be a downfall for any golfers. You do not have to be part of the statistics because you can correct the mistake before they cause too many frustrations on the course. Avoid being accused of being a slow player by following these simple tips. A slice happens when the ball travels in an arch from left to right for the right-handed golfer. A hook occurs when the same golfer hits the ball, and instead of going straight, it cuts back to the left severely. Both these defects occur because the stance is out of alignment or the swing is being forced. A quick lesson with the club pro normally fixes the problem.